opens a new windowA monster under the bed is a familiar childhood terror for many. For the little tiger in Emily Tetri’s Tiger vs. Nightmare, however, Monster is a cherished friend, playmate, and champion. Every night, after Tiger drifts off to sleep, Monster fights off Tiger’s nightmares, keeping them from disturbing Tiger’s rest. Some nightmares are scary even to monsters, though, and Monster soon encounters a Nightmare too terrifying to fight off. Will Tiger be able to help her friend? Can she be brave enough to protect Monster and defeat her own fears? 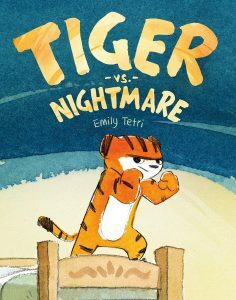 Tiger vs. Nightmare, a 2019 Geisel Honor book, is a charming spin on a classic childhood struggle with a satisfying ending that will empower young readers to face down and control their fears. The graphic novel format has enough text to move beyond picture book territory, without overwhelming beginning readers. Tetri’s illustrations bring the story to life and will have readers shivering at the sight of Nightmare and cheering for the adorable friend duo. The background illustrations, including Tiger’s parents’ building projects, provide fun side stories as well, inviting readers back for a second (and third and fourth) look. Readers looking for more books about facing your fears should check out Mercer Mayer’s There’s a Nightmare in My Closet and Dan Santat’s After the Fall: How Humpty Dumpty Got Back Up Again. Those who enjoy the comic format might want to meet another perennial favorite tiger in Bill Watterson’s Calvin and Hobbes.